These Scot’s Eggs are made with Hayter’s Extra Lean Ground Turkey (dark meat). They are the perfect addition to your weekend breakfast or brunch. They also make a quick, healthy, portable lunch item. Delicious and Nutritious: High in Protein, Low Carb, Wheat-free, and Gluten-free. Gently mix Hayter’s Extra Lean Ground Turkey with spices. Grab a small handful of ground turkey, flatten, and set egg in centre. 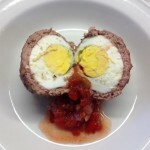 Carefully work the ground meat around the egg. Press gently and completely cover entire egg. Place prepared eggs on a cookie sheet lined with parchment paper. Bake in oven for 30 minutes. Remove from oven. Let cool slightly and serve warm. You could add many other spices, including cayenne pepper. The baked eggs keep well in refrigerator for up to a week. Freeze well if you defrost in frig and take care with reheating. Serve warm or cold. Slice egg in half. Top with a dollop of chili sauce, tomato chutney, horseradish, or condiment of your choice.